Wrist Band Poker Marked Playing Cards Scanner Camera different from other poker camera devices. This is the latest scanner camera device for poker game and used in any objects that can be allowed in casino. Cheating cards wristband device can be worm of the player’s wrist with a small scanner which detect all the cards with accuracy, stability and in fast speed. 1. 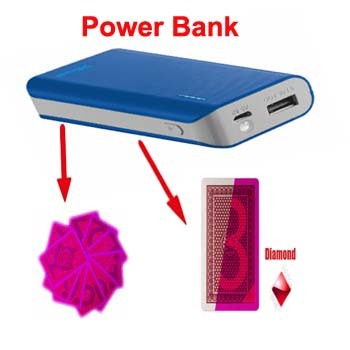 First of all user need to connect wristband poker cheat device with the power bank for power supply. 2. Put the power bank in your secret pocket and turn the wristband marked playing cards device while play card game. 3. As soon as the hand with wristband poker cheat device scan the barcode marked deck it can scan whole the cards with high speed, more accuracy and with more stability. 5. As earlier as the poker scanner analyzes the data player will hear the poker result through the mini earpiece.